Inscribed 'AP JPIKE' below image. Inscribed 'ATS_1036/ATS_1036_338 2014L/0495 CP19' on reverse. 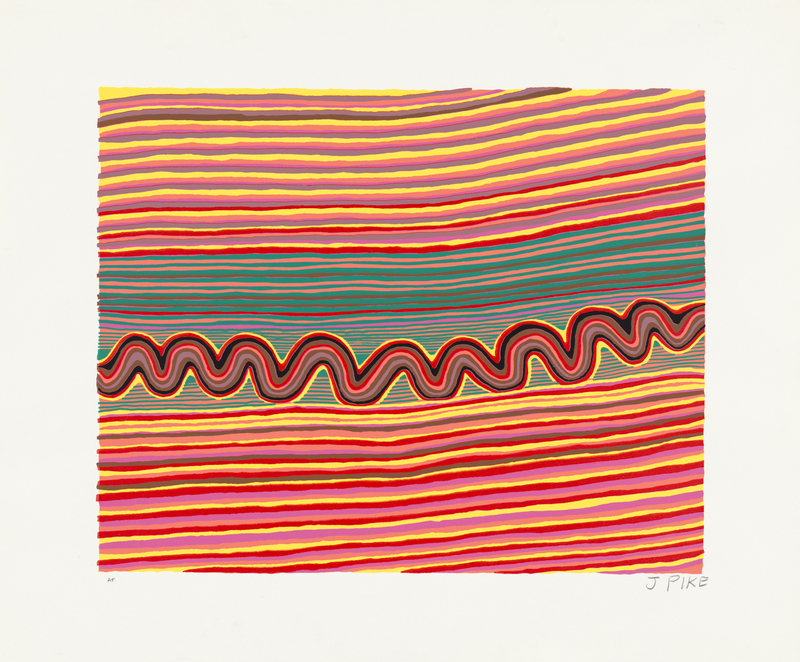 Two snakes bin travelling, Dreamtime, through green grass, sandhills on both sides. They make big track first, then the small track. They find big mob of people playing corroboree, and the two fellas went round [them], one on each side. They made the ground soft with their tails. The people were in the middle, like an island. The snakes made the ground damp and sink down, and drown all the people. Then they ate all the people. Then they keep going. They make camp and sink down in the water on two sides, one good one, one salty one. When they bin go, they bin make a camp right there. That’s country for Looma people.